With a long history and the durability to last for generations, solid wood flooring is one of the most desirable flooring choices today. With an unmistakable and completely irresistible feel and character, solid wood flooring can bring something very special to your home, though it does require special care and attention when installing. As a natural living product, solid wood will shrink and expand as your room changes temperature and as humidity rises and falls. For this reason, really careful attention has to be paid to installation to make sure that the planks are given sufficient room to move. While solid wood is available with click together joints on selected narrow styles, the extra stresses and strains put on these type of joints means that we recommended solid wood floors with tongue and groove joints (T&G) are used. Offering multiple installation method, T&G joints can deliver an exceptionally strong and lasting joint that is better at resisting stress. 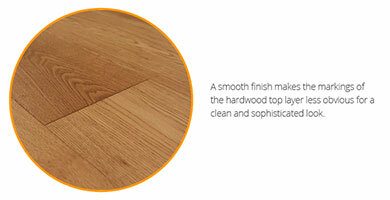 If you are looking for a fast and easy wood flooring then our engineered wood styles may make a better choice. 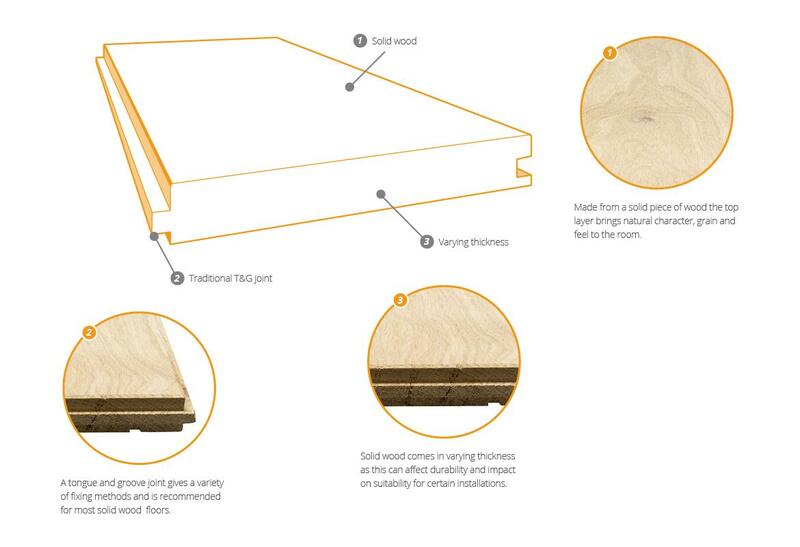 To find out how to install solid wood flooring with T&G joints, just visit our How to install solid wood flooring guide. Solid wood flooring is available in a variety of different thickness, depending on the durability and application of the floor. In most domestic locations where you are installing solid wood directly over an existing subfloor, such as concrete or plywood, you can choose whatever thickness suits your needs or budget. However, for installations on top of floor joists, such as in a newly built extension on in extensive refurbishment of an older property, solid wood flooring must be at least 20mm thick as it will act as a load bearing floor. For extra reassurance, at UK Flooring Direct we would recommend a solid wood flooring of at least 20mm thick be used in these applications. 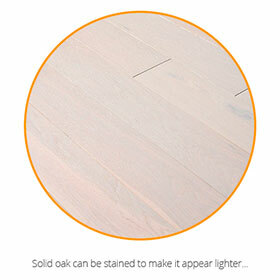 As a natural product, solid wood flooring needs to become used tot he conditions of your home before it is installed. This is called the Acclimatisation Period. Given that solid wood is a natural product that can move with changes in climate it is best to let your floor 'settle' into its new environment before you install it. We recommended a minimum of 14 days between receiving your floor and installing it. You can find out more about why it's important to acclimatise your flooring in our What is Acclimatisation guide. The look of solid wood flooring depends on four main aspects; the species of wood, the grade of the grain, surface finish and the size of the plank. The width and length of the plank are covered in our How to Get Your Style Right guide. As it's made from one piece of timber, solid wood tends to be available in more common species such as oak. More unusual woods such as merbau or maple would be hugely expensive in solid wood, so these are generally reserved for engineered wood flooring. However, if you are seeking a darker or paler look than that of natural oak, solid wood flooring is available in many different stains and finishes. 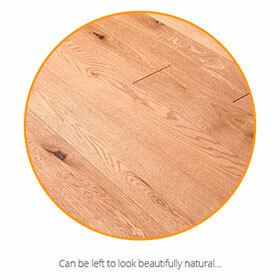 The grade of the solid wood is no an assessment of quality, but of how your floor will look. While you may have heard of a floor being referred to as 'rustic', 'nature' or 'premium', the exact definition can change dramatically from country of origin. At UK Flooring Direct we grade all of our floors with our own system to ensure a cleaner process that makes it easier to choose your floor. You can find out how the grade of solid wood flooring will affect the look in your home by visiting our Grading pages. The top of a solid wood floor can be brushed or sanded smoother to change its appearance. 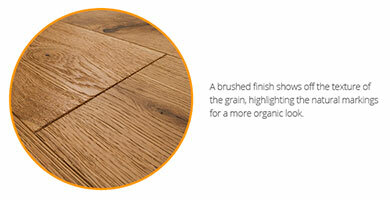 A brushed surface will raise the texture and markings of the grain, giving the floor a more natural and organic quality. 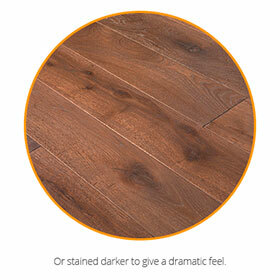 A floor that has been sanded smooth has less tangible texture and is a popular choice in contemporary style interiors. When it comes to investing in your floor, there are few better options than solid wood flooring as it really can last a lifetime. In fact, if well cared for a solid wood floor can last for generations in most hones and as testament to this our Galleria Professional solid wood floors are given an extraordinary lifetime warranty. It is the thickness of the wood's surface and the finish it has that will have the most impact on living with your solid wood floor. At 20mm thick our Galleria professional solid wood floors offer superb longevity and can be sanded several times through their lifetime. Given that a well-cared for solid wood floor may not need to be sanded for 20 years under most domestic situations, it's easy to see why solid wood is considered to be the best possible flooring investment for your home. However, the finish of you wood floor can have an impact on its suitability for the room and here at UK Flooring Direct, we use two main types of finish, oil and lacquer. 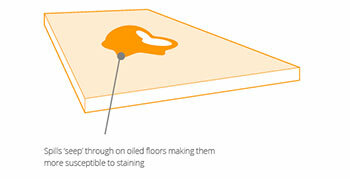 If you want an organic appearance to your floor then oil finishes offer the most natural look. Several layers of oil are applied in the finishing process, absorbing into the wood to give some protection. The oil allows to original texture and feel of the wood to remain though will require periodic intensive maintenance with a top-up oil to wood drying out. Oil finishes show signs of wear in areas used the most, so develop a wonderful 'lived in' feel that is unique to your home. However, they are more susceptible to marks and spills so are not recommended for use in kitchens. 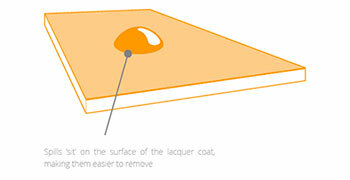 Available in either satin or matt look, several layers of a lacquer are applied to the surface of the hardwood top layer to form a protective 'barrier'. In a satin finish, lacquered engineered wood flooring give a clean and contemporary feel to the home, while matt varieties give a more classic and natural look. Easier to look after than oil finishes, lacquered floors can be used in busy areas such as kitchens and dining rooms as they are more resistant to spills and marks. However, once worn, a lacquer finish will need to be sanded off and reapplied. Our premium lacquers are exceptionally tough, so this will not be for several years in most homes. Hard wearing, solid wood flooring can be used in most areas of the home including dining and living rooms, hallways, kitchens and bedrooms. However, it's important to remember that it's still a natural product and particularly susceptible to water, so we do not recommend solid wood in bathrooms or any other high moisture environment where there is a potential for leaks such as utility rooms. If you are choosing your floor for the kitchen or hallway, we recommend a lacquer finish as it is easier to maintain and is better at resisting spills and marks than an oiled floor. If your home as underfloor heating, then we do not recommend solid wood flooring as it is susceptible to movement when exposed to direct hear. For this reason too, solid wood flooring is also not recommended for conservatories. That should be everything you need to know about laminate flooring from UK Flooring Direct, but if you have any more questions then don't forget our Education Centre is full of useful information. Or you can call one of our Personal Flooring Experts on 02476 012 840 who will be able to help you on the way to finding your perfect floor.